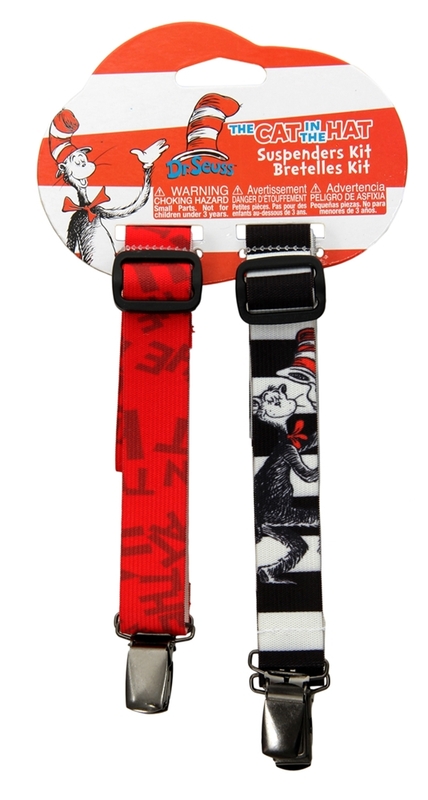 You'll look whimsically dapper in these Dr. Seuss Cat in the Hat Mismatched Suspenders. The Dr. Seuss suspenders kit includes a red suspender and a black and white striped one featuring the Cat in the Hat. The set of suspenders features a black adjuster for a perfect fit and silver metal clasps. Perfect for Dr. Seuss themed Halloween costumes, this set of suspenders is also great for everyday wear.